The contest for "The Secret Year" ends tonight, so less than an hour to enter! Click here to learn more about the contest and enter. Good luck to everyone! HarperTeen has "Wonderous Strange" available online to read for free. Click the widget bellow to get started! They also posted more content online from Lauren Conrad's latest book "Sweet Little Lies". I posted the link for "L.A. Candy" as well incase you haven't checked that book out yet. Summary: When Cassie was a little girl, her grandmother told her a fairy tale about her mother, who made a deal with the Polar Bear King and was swept away to the ends of the earth. Now that Cassie is older, she knows the story was a nice way of saying her mother had died. Cassie lives with her father at an Arctic research station, is determined to become a scientist, and has no time for make-believe. I thought this was a fantastic adaptation of the Norwegian fairytale "East of the Sun and West of the Moon". She successfully brought the story into a modern setting while creating a world full of beauty and magic. Durst was able to add more to the story by creating a subplot about the Polar Bear King's duties to polar bears. The Polar Bear King is given a personality and responsibilities that make him a sympathetic character to readers, making him more than just a beast who captures a beautiful girl. Cassie is a strong female character who fights for what she believes in no matter how dangerous. Even though there were points where I wanted to slap her, by the end of the book she had developed from a girl to a young woman. I know this all sounds very vague, but I don't want to give away the plot. Her actions at the beginning of the book are those of a girl, but through her experiences she becomes a women who is able to achieve the unthinkable. This book was fast paced and I had trouble putting it down. Cassie's journey took me through incredible places that Durst was able to bring to life through her writing. I would recommend this book to anyone who enjoys fantasy, romance, and adaptations of fairy tales. Durst is author of "Into the Wild" and "Out of the Wild" which are supposed to be fantastic books. They are for a younger audience, but I know many teens enjoy these books as well. If you want to hear more about the author or see excerpts from her books then go to her website here. I was lucky enough to meet Sarah at a signing she did at my store when "Out of the Wild" came out. She is really sweet and I enjoyed learning about her books. I can't wait to see what she writes next! I also recommend checking out the fairy tale that the book is based off of. I hear there are also beautiful picture books of this fairy tale. Synopsis: Take Romeo and Juliet. Add The Outsiders. Mix thoroughly. I was so excited when this book came in the mail because I was dying to read it and I forgot that I had preordered it during Christmas. It was a really quick read and I enjoyed it a lot. I especially liked the fact that it was a love story told from the male perspective. I honestly can't tell you why I didn't love this book. The plot had a lot of great depth. There was the initial plot about the Colt trying to get over the death of Julia, but there were also conflicts between Colt and his friends; as well as the conflict between the Black Mountain and flats kids. I really liked the characters in this book. Colt interested me a lot because he reminded me of some of the guys I know. I also was fascinated by Julia’s notes and was dying to know more about her. Even though she wasn’t the easiest character to like, I still felt myself drawn to her. Jennifer Hubbard wrote a great first novel. I’m not sure why this book didn’t quite make it into the love category, but I have to say I hope to read more by her. I am glad that I have the book in hardcover and I’ve already passed it onto one of my friends. She was going through the pile of ARCs I got at the ALA conference and HAD to read “The Secret Year”. I would recommend this book to people who are fans of Sarah Dessen, John Green, and other realistic fiction authors. I am so sure that you guys will enjoy this book as much as I did that I am going to be giving away the ARC I have! If you want to enter to win the book, please click here for more information. I am hoping to have more contests on this blog and thought it would be helpful to have contest policies. You must be 13 or older to enter any contests on this blog. I will be e-mailing you for contact information so be sure you type in your e-mail correctly. Check, double check, and maybe even triple check deadlines! Most contests are only open to US residents, but check to see who the contest is open to so you don't miss out. Follow the instructions so I don't have to disqualify you. Make sure you type in your contact information correctly. These policies can be changed whenever I feel it is necessary. I'll try to give clear instructions for all contests. 1. 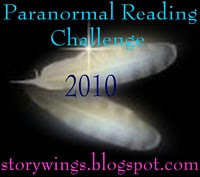 The Paranormal Reading Challenge is for anyone who loves reading ANYTHING paranormal!!! - Vampires, Werewolves, Witches, Ghosts, Angels etc...so the scope is pretty big!!! - The books can be any sub genre under Paranormal - romance, YA, mystery, etc. 2. The book has to be a book. No free short stories, or writing sites. 3. If you are a blogger please post a link back to this challenge on your page to let others join in the fun. -Non-bloggers - it's ok, you can join to and you can keep track of your progress by yourself, and post a comment on the wrap-up page, or you can send comments to this page to keep track of your progress. 4. Cross-overs from other challenges are accepted. As are re-reads. Books that were started in 2009 don't count. 7. To officially enter sign up with Mr. Linky and link to the post on your blog about this contest. I am going to try to reach the Angel level because I read so many paranormal books as it is. I might as well make it challenging... considering it is a challenge and all. Synopsis: After 150 years of terraforming, Aqua, the planet formerly known as Mars, Now has more than 90 percent of its surface covered in water. A young girl named Akari Mizunashi arrives at the city of Neo-Venezia, an exact replica of the old Italian city of Venice, hoping to become an Undine, the most coveted job on Aqua. Hold on tight and follow Akari's adventures as she discovers the wonders of Aria in this Prequel to the Aria Anime and Manga Series. Synopsis: On the Beautiful planet of Aqua, Akari Mizunashi has the perfect job: showing tourists the wonders of the city of Neo Venezia by gondola! Akari has finished the first part of her training, and she is ready to start taking on passengers of her own, but her first customer is going to be a real challenge. Can Akari prove that she's up to the task? And what will happen when the president of Aria sets out on his own to prove the company that he's useful? It's summer in Neo Venezia, and it's going to be a season full of lovely surprises! I am starting this review with the warning that I have never reviewed manga before and honestly haven't read very much of it. That is my little disclaimer! My brother was amazing enough to buy me some manga for Christmas because I haven't read any for over a year and I missed it! I am really glad he bought me these two prequel books to the series "Aria" because I thought they were fantastic. I found the illustrations to be beautiful, but also a lot of fun. Even though the storyline didn't have a lot of action, I still found it to be fast paced. I love the character Akari and the President of Aria, who is a cat! I wasn't sure how a cat company president would work in the story line, but it was very amusing and adorable. I immediately ordered the 5 books in the "Aria" series because I enjoyed these books so much. I was able to read both books in less than two hours while watching TV, so they are the perfect quick read. I haven't watched the anime of the series because my brother said that it would give away the rest of the books, but it is something I will look into once I finish "Aria". This series is great for anyone ages 12 and up. There is no sexual content, so you don't have to worry about it if it isn't your thing. When this peculiar ad appears in the newspaper, dozens of children enroll to take a series of mysterious, mind-bending tests. (And you, dear listener, can test your wits right alongside them.) But in the end just four very special children will succeed. Their challenge: to go on a secret mission that only the most intelligent and resourceful children could complete. To accomplish it they will have to go undercover at the Learning Institute for the Very Enlightened, where the only rule is that there are no rules. I have been waiting so long to read this book because of all the fantastic reviews and it was worth the wait. Usually I need at least some kind of romantic interest to keep me interested in a book, but I found that I did not care that this book was written for a younger audience. It had me at the edge of my seat and I had trouble putting it down. I was listening to it on audio and reading it so that I could get through it faster. I was just dying to know how it would all end! The characters in the book are really unique. They have these kind of semi-super abilities that allows them to solve problems in different ways. It was really neat to see how their gifts got them through sticky situations. I also thought that the characters had a lot of depth. They were not perfect and Constance wasn't a very likable character, but they all played their part. Stewart was able to write a book that was clever, funny, and suspenseful. He has a unique voice that captivated me from start to finish. There were a lot of layers to the book and I think Stewart did a wonderful job at balancing them all. Even though the book was primarily an adventure, it still managed to touch on deeper topics like friendship and family. I am definitely going to be finishing up this series soon because I can't wait to see what the characters do next. I think this book is perfect for people who like mysteries and series like "Harry Potter".